me and my best friend has known each other since our senior year back in highschool. he was my classmate and we were both transferees from different schools. we had the same barkada (group of friends) but after graduation and college started, we lost contact of most of them. i still keep with me the snail letters and greeting cards he sent me during those days when text messaging and facebook was non-existent. i am just glad that i have met someone like him, someone who is real, someone unpretending. this post ticks off one of my “10 things i have not done before” list where me and my high school best friend spent a weekend in panglao island, bohol last july, 2012 (post to follow!). 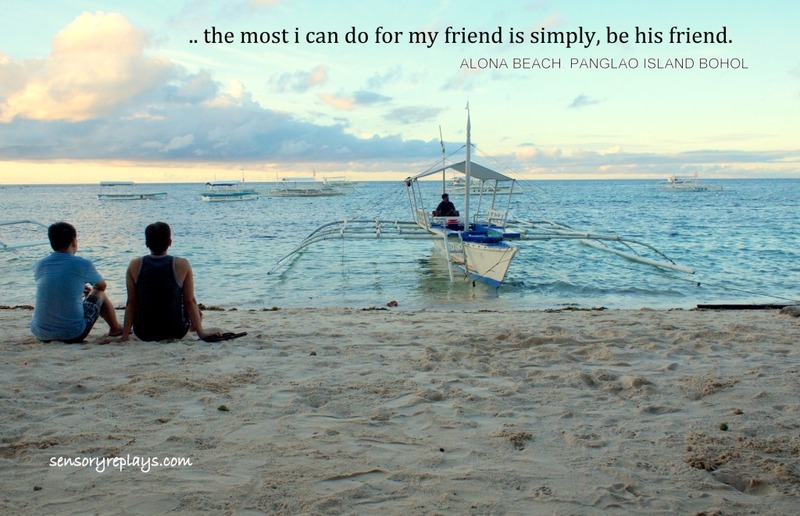 This entry was posted in thinking thoughts and tagged 10 things i have not done before, alona beach, beach destinations, best friends, bohol, friendship, panglao, panglao island. Bookmark the permalink. so very nice to to learn that you got together with your bff. idk when i’ll be able to get together with mine. so much distance separates us. .. it was great to spend a weekend with him ewok and i hope you get a chance to meet up with your bff soon. alam mo si wendy, maka-family sya. yes, i love that. pero sabi ko sa kanya, we still need friends. we need true friends. diba? .. likely wendy has not met her best friend or has not considered one yet. .. serious ba? haha. hayaan mo na’t minsan lang yan. .. hi wits! i believe so too. PS. ilang beses na kong naggrocery, hindi ko makita ung lemon-pepper Tang. mukhang out of stock (o fast moving, hehe). .. yes i agree, you accept them as they are! .. hmm, out of stock? baka favorite flavor yun ng mga bahrainis, hehe. .. malapit na yun, ‘ber’ months na eh. once you get to find one of that drink, blog mo rin! .. advanced greetings too lea. i am reminded that the best friend in my life is gone. long gone; but his memory lives forever with me – the fun time we had, the perils we shared, the money we considered as one, the drinking and girl chasing we did… i can go on and on but it will only make me sadder. cherish your best friend or friends, they are a part of your life money cannot replace. .. sad that he left too early bert. but i do believe you, money can’t even buy friends for it’ll all be temporary. i’ve been to that situation.